After 28 years, the Oromo Peoples Democratic Organization (OPDO) rebranded itself to the Oromo Democratic Party (ODP) and introduced the anthem and a new logo which features Oda tree and Geda colors (red, black and white) on its 9th Congress at Jimma town, in South West Ethiopia last week. The party officials said that the changes were introduced to reflect the new chapter of struggle the party has reached. 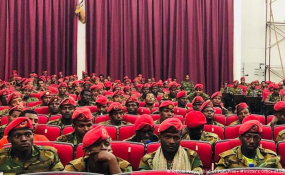 Being one of the four member parties of the ruling coalition in Ethiopian People’s Revolutionary Democratic Front (EPRDF), it has become major power player within the coalition. Apart from rebranding its name, the party also retired its long-serving veterans and founders from the leadership; and it has brought new young leaders to the front to fill in the positions. What is significance of retiring veteran politicians who have long experiences in the party and replacing them with the young leaders? acceptable in any party or organization. “Handing over the power to the next generation significantly improves the leadership within the party. Here, the question is how is it done? Is the succession democratic? Is the purpose to improve the leadership? Is it done intentionally? Dr. Lidetu added that if the party has brought the young leaders to top position considering that they would sustain the ongoing political reform it had already started, the party in particular and the nation in general benefit much from this kind of practice. “If these young leaders are more energetic, motivated, visionary and skillful enough to accommodate the prevailing diversity and meet the demands of the positions, trusting them for such big responsibilities would transform the leadership within the party,” he said. take time to plan for leadership succession to ensure leadership continuity with lasting fruits,” he said.